To be successful selling coins requires knowledge. One sales channel that works for a lot of people is selling directly to a coin dealer. 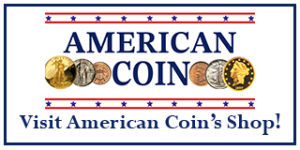 American Coin is an established coin store that’s been around for more than 20 years. We are always interested in purchasing coins. If you wish, you can sell your coins to American Coin by following our Packaging and Sending Coins instructions, and mailing us the coins. We will send you the payment for the coins based on an offer that is competitive with what you could get walking into a local coin store, but with greater convenience. The benefit is that you don’t have to do any legwork. You don’t have to learn anything about your coins. You get your money quickly without a fuss. You can check to see what your coin could be worth with our What Is It Worth? general overview. Please Contact Us for a current copy of our Price Guide that shows the minimum prices we are willing to pay for problem free coins. Of course, many coins warrant higher prices due to date, mint mark, rarity or other reasons. Selling coins is simple, right? You just look up a coin dealer, take the coins to his shop and take whatever he offers you and go home fat and happy. Well, that is exactly what a large number of people do. This is not the best way to maximize your earning potential, but it is very convenient. The typical retail coin shop works on a 35-40 percent buy-sell spread. This shouldn’t be really all that shocking since most retail outlets have this level of markup on most of the goods they sell. In addition, most dealers will not (and cannot) take the time to closely examine your coins for rare die varieties. Most don’t even know about most of the varieties (heck, many haven’t even been discovered yet). Many dealers will look at a pile of walking liberty half dollars, look at a few and state that they are worth silver melt value, despite the fact that a rare date and mint mark or variety may be lurking somewhere in the bag. Collectors find rarer dates in junk coins with some frequency. Most dealers just don’t have the time or inclination to look at every coin that moves through their shop. Now, if you have a little knowledge, you can go through the bag sorting the common dates from the less common dates. You can also separate the higher grade coins from the rest before you go to the dealer. You will then have a greater degree of certainty that you aren’t selling a $300 coin for silver melt value. When you show the dealer the rare date coins separately, he is more likely to take a closer look because he doesn’t have to take up so much of his own time to do so. Help him to help you as much as possible. Do not expect a dealer to offer you a greater than common price for your coins if you aren’t aware of the fact yourself. Many dealers will treat you with greater care and respect if you present some knowledge in the subject area. It’s just like cars, car dealers always go into more detail with the people that know what they are talking about. You wouldn’t sell a car without checking the blue book price, would you? Don’t sell a coin without knowing the Redbook price. At the other end of the spectrum, you can open your own coin store. You can now sell coins at retail prices and buy them at wholesale. Again, this takes a lifetime of dedication that most people don’t want to invest just to sell a few coins or even to build a great collection. For quite a bit less, you can set up a table at a coin show, and liquidate the best parts of your collection in a few days. Of course, this requires some knowledge, in order to properly label the coins, and entails a bit of risk as well. This is best left to someone who has a very good idea of what is going on. If you have done your preliminary homework and find that your coins have a rather high value, say over $50 each, then you might consider an auction house. Most of the traditional auction houses take about a 15% cut between the buyer and the seller. That is, if a coin receives a high bid of $100, the buyer actually pays more, say $107.50 and the seller only receives $92.50. Sometimes you will see “no seller’s fees” auctions or “no buyer’s fees” auctions. This doesn’t mean that the overall spread is any less, just that one side pays the entire bill. Nevertheless, 15% is a lot better than 35%. Also, for very high end coins, the auction house will attribute the coin with respect to variety. They will also grade the coin and perhaps even get it slabbed prior to sale. They may even take a picture of your coin and print it in a catalogue. Even if the auction house doesn’t fully attribute your coin, if it is rare, some astute buyer may pay more for it. All in all, auctions are not a bad way to sell higher priced coins. Of course, since there are bargains to be had at nearly every auction, your coin could end up being the bargain on a given day. There is, therefore, a certain amount of risk. Often, you can set the lowest price (reserve) that you are willing to accept for a coin and if nobody bids above that, you get to keep the coin. In all types of auctions, if you keep (buy back) the coin, there is an expense associated with having participated in the auction. This is normally around 50% of the spread the auction house would have made had the coin been successfully sold. This is steep enough that you really want to avoid it, so set your reserve fairly low. It is also fair to the auction house, as they did all the work they normally would have to do even if the coin sold. 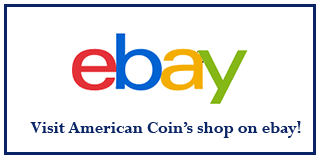 More often, however, many sellers set up a storefront and sell on the large online shopping sites like eBay, Amazon and Yahoo. Consigning coins to a sight unseen auction may also be an option. Most sight unseen auctions these days (other than some on the Internet) require you to submit only slabbed coins. That is, coins graded by a professional grading service, and encased in a plastic tamper resistant package. If you have a rather ugly or slightly over graded coin, but it is in a slab, then this is definitely the best way to go. . Like other auctions these generally work with about a 15% spread. Be careful however to note the mailing expenses, minimum charges, etc. on lower priced coins. You might not end up getting any money at all out of a $25 coin, and you might get less than a coin dealer would offer for a $50 coin. The CCE is another sight unseen trading network. It doesn’t really apply to this discussion as participating requires you to be a coin dealer. It’s not even that great of a deal for dealers since it is fairly expensive to participate. Many coin shops have a form of consignment known as a bid board. A bid board is a place where collectors can display their coins and other customers can write in an amount they are willing to pay for the coin. It is sort of like a slow motion auction. Most of the online auctions are kind of like this in that the auction is open for a week or two at a time. 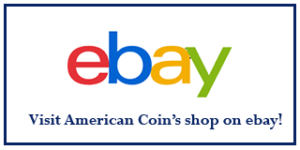 True bid boards (unlike most Internet auctions) are constantly rotating the coins on display and some of the coins will be closing on nearly any given day. When a coin sells, the dealer takes a cut. This ranges wildly depending on the dealer. Selling coins through mail bid auctions is rather difficult. This method is typically reserved to dealers who build up good mailing lists over a long period of time, and build up a reputation. It is possible that there are mail bid auctions that accept consignments, but I haven’t heard of any. If you can find a cooperative dealer, you can put your coins on sale on a consignment basis. This is good for the dealer because he doesn’t have to invest the capital to buy your coins before he can make a profit off of them. Be sure that you set a minimum amount that you are willing to sell the coin for, as if you do not, the dealer will still make a percentage profit selling it for less than its full value. Remember that with consignments, dealers make money off of moving the maximum number of coins. Although it may be somewhat difficult to find dealers willing to work on a consignment basis, the fees should be in the 5-20% range depending on the value of the coin. Unlike an auction, you might sit on the coin for a long time before it sells. Another option is to sell coins via the classified section of a numismatic newspaper. However, this is viewed with enough suspicion that you may have to set the price fairly low for someone to take the risk of sending you the money. Fortunately, there isn’t a lot of abuse of this type of system, and there are a lot of honest people out there. This carries with it some of the risks of being a dealer. For example, if the coin is counterfeit, you could conceivably get into trouble and might have to buy the coin back. Online classifieds are perhaps even more risky in that there is not normally a mechanism for reporting abuses in the system as there is with most newspapers. Coin shows are a great place to sell coins. You can quickly get competing bids, you can nearly always find a buyer willing to pay a reasonable price. Some of the vest pocket dealers (that sometimes work on 10%-15% rather than the store front dealers with their 30%-40%) are there, and can provide good bids for your coins. Coin Shows often have auctions associated with them. There are general risks involved with many different ways of selling. The most common risk is sending a coin to someone you don’t know before you have your money. However, this is easily avoided. Usually, mail transactions are conducted with the risk initially being taken by the buyer. That is, the buyer sends the money to the seller, then the seller sends the coin. Most sellers will grant a short 3-15 day period in which the buyer can return the coin if not satisfied. Not all sellers give this right, so make sure that it is understood up front. Once you build up a relationship, you can send your coins to customers “on approval” with less risk. The mail itself presents some risk, but purchasing insurance from the post office can ameliorate this risk. Remember they sent the Hope Diamond through the US mail service once. Also, certified mail can sometimes be useful, but not perfect. I once had a piece of certified mail that was signed for by somebody else! Brokerage services can be a real help in these situations. There are several general brokerage services that will take the risk out of sight unseen transactions for general merchandise. 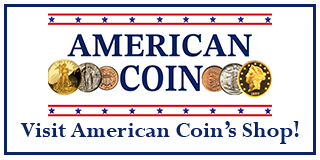 However, American Coin provides the only brokerage service specific to coins that I am aware of.